Just a few miles outside of Astoria is the shipwreck of the Peter Iredale. Astoria is often considered the northernmost town of the Oregon coast, though technically Astoria is located on the Columbia River close to where it enters the ocean rather than on the coast itself. Astoria is an interesting mix of rough around the edges port town and historic collection of Victorian homes. 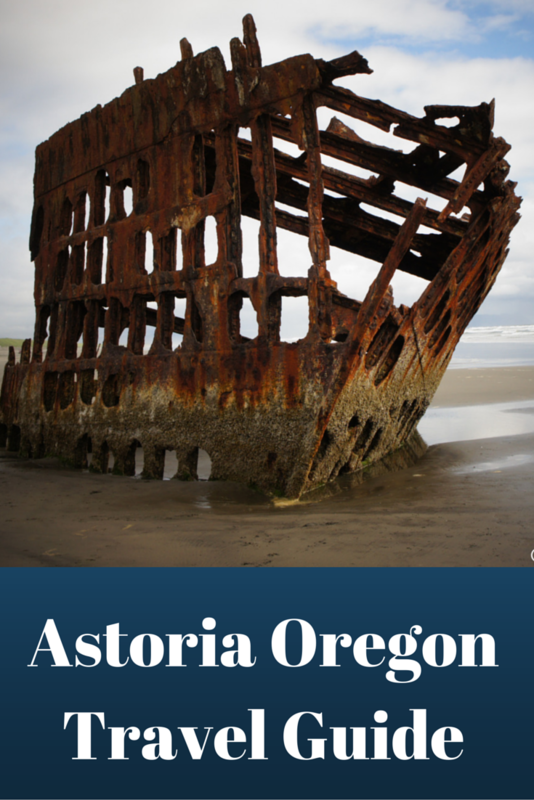 There is a lot to do and see in Astoria and travelers will want to start their Oregon coast vacation in Astoria. The Columbia River Maritime Museum is a very well designed and curated museum. The Columbia River Maritime Museum tells the story of the Columbia River using exhibits of ships, lighthouses, weapons, scrimshaw, and other seafaring paraphernalia. There is even an original document signed by Abraham Lincoln. One thought provoking exhibit was that of the USS Astoria which was sent on a mission to Japan in 1939 to return the remains of the Japanese Ambassador to the United States to his homeland for his funeral. In a letter home, sailor George Laury wrote of his experience, “Yesterday we were given a sight seeing trip to Tokyo and vicinity and visited all the national shrines, the Imperial Palace and parks and gardens and other spots of beauty and interest. . . . They are the most pleasant and sociable people I have ever met. They can’t seem to do enough for us. Our uniform is enough to get us entrance to anything or go anywhere without cost. They bow to us and salute us everywhere we go. I’m really enjoying this visit and so is everyone else. I would sure hate to have to fight these people.” Two years later the United States was at war with Japan. The Columbia River Maritime Museum is a very hands-on museum and even has the bridge of the USS Knapp displayed, which visitors can walk through. Serenity in the Flavel House Museum garden. The Flavel House Museum is on the Register of Historic Places and is a well-preserved example of Queen Anne architecture. The Flavel House Museum was the home of Captain George Flavel, a very influential Astoria citizen, and his family. The home was completed in 1886 and remained in the family until 1934. The home is beautifully furnished in period style with little reminders of Astoria’s ties to the sea, such as a hand-painted stained glass window of a ship at sea. Across the street from the Flavel House Museum is the Oregon Film Museum, located in the old Clatsop County Jail. The Oregon Film Museum features exhibits from many movies that have been filmed in Oregon, but the most prominent movie featured is The Goonies, as some of the movie was filmed in the jail. The museum is a lot of fun for fans of The Goonies and for kids. Visitors can even create their own short films using the museum’s sets and props, though ours sadly never arrived in our email inbox. The view of Astoria from Astoria Column. The Astoria Column, modeled after the Trajan Column in Rome, is a 125-foot column illustrating the three events that allowed the United States to acquire the state of Oregon as well as Washington, Idaho, and parts of Montana and Wyoming. The Astoria Column is located on a hill above the city of Astoria and provides great views of Astoria and the Astoria-Megler Bridge crossing the Columbia River. Kids will have fun visiting the Astoria Column as they can purchase light wood airplanes they can launch from the top of the column. Fort Stevens State Park is just eight miles outside of Astoria. Fort Stevens, named for General Isaac Ingalls Stevens, was built in 1864 and decommissioned in 1947. The fort was built for the Civil War because it was thought the English might help the Confederates and come through from Canada. Fort Stevens was also the site of an attack on U.S. soil during World War II. On June 21, 1942, a Japanese submarine made its way through the minefields and fired at the fort at night. Because the fort did not return fire, the fort’s position was not revealed and the attack was unsuccessful. Visitors to Fort Stevens State Park can visit the small Fort Stevens State Park Military Museum and walk through many of the fort’s buildings. Some of the old graves in Fort Stevens Post Cemetery. Fort Stevens Post Cemetery dates back to 1868 with some of the oldest-surviving grave stones in the county. However, the cemetery’s current location was built in 1905. Some of Fort Stevens Post Cemetery’s residents have unique causes of death. The first burial was of Private August Stahlberger, who died of “falling in the river and drowning while under the influence.” Also within the Fort Stevens State Park boundaries is the Peter Iredale shipwreck, a ship that wrecked on the dangerous sandbars in the mouth of the Columbia River. The rusted skeleton of a ship stranded on the sand provides for a very picturesque setting. The best fish and chips come from a grounded boat. When we checked into our hotel we asked at the front desk which was the best place for lunch in Astoria. With no hesitation we were told to get fish and chips at the Bowpicker. Bowpicker Fish & Chips isn’t a sit-down restaurant. It’s not even a hole-in-the-wall takeaway shop. Bowpicker Fish & Chips is located in a converted fishing boat docked on a lawn across the street from the Columbia River Maritime Museum. The fish is hand-battered to order and fried in the tiny cabin of the refurbished gillnet boat. Rather than using cod, Ron and Linda lightly batter Albacore tuna, which is served with thick steak fries. My apologies to the purists, but I loved the Albacore fish and chips much better than the traditional cod. Bowpicker Fish & Chips is popular with locals and tourists alike and always has a long line, even when it’s raining. We struck up a conversation with a gentleman from Washington who drives over 200 miles to eat the fish and chips . . . and visit his daughter. Traditional Bosnian coffee completed our meal at Drina Daisy. We were excited to learn Astoria has a Bosnian Restaurant, Drina Daisy. Drina Daisy serves “comfort food with an old-world twist.” The menu includes a variety of Bosnian food including braised meats served with sour cream, entrees wrapped in phyllo pastry, and cured meats. Our meal was completed with traditional Bosnian coffee. It was fun to even see Cockta on the menu, Yugoslavia’s version of Coca-Cola during the communist era, which we had tasted when visiting Lake Bled in Slovenia. Even cats hope to get a nibble at Rollin' Thunder BBQ. Locals are also fans of Rollin’ Thunder BBQ for eating in or taking away barbecue. Rollin’ Thunder BBQ is a one-man shop and sells barbecue meat each night until it sells out. Jars of Astoria beer at Fort George Brewery + Public House. Beer lovers will want to take a seat at the bar of Fort George Brewery + Public House. Fort George Brewery’s beers are served in Ball canning jars. My favorite beer was the Working Girl Porter, brewed with Working Girl coffee beans. Fort George Brewery also serves food. Another great place for one of my favorite Oregon beers is Rogue Public House, located on Pier 39, which can be reached by actually driving over the water on the wooden pier. Astoria is a funky Oregon town with quite a mix of attractions. In addition to the above-listed things to do in Astoria, it’s fun to just walk around the small town looking at the old buildings and enjoying the fun touches like trash cans made to look like canned fish with retro labels, always a reminder that Astoria is first and foremost a port town.